The Vent-Axia Opal range of Aluminium Radiators offers a slim stylish design with advanced digital thermostatic control giving you one of the most cost effective and energy efficient electric heating system you can have. Popular with specifiers, contractors and home owners, the Opal range is ideal for new build and refurbishment. Available in five sizes, our range provides a solution for any size room with outputs from 500W - 1500W. All of the Opal Aluminium Radiators controllers are fully programmable offering closer management of energy control with resultant costs savings. This can be measured with the on board energy monitor allowing you to see how much energy you are using to heat your room. All standard units come with all the features and controls you would expect to see on an advanced heating system. Accurate, fast acting control is essential for reducing temperature overrun and minimising energy consumption. The silent operating electronic thermostat is accurate to +/- 0.5˚C and acts quickly to maintain consistent temperature levels. The heater is pre-programmed with seven plans during its manufacture, with two of them being configurable to meet your own needs. The five pre-set programmes are adapted to most heating situations. Heating schedule PLnF is pre-programmed for when you are away from your home for a long period of time and would like to protect it against freezing. The green economy LED will flash. Heating schedule PLUE is designed for weekends. With this plan the heater is pre-programmed to work from Monday to Thursday in the antifreeze position. From Friday through to Sunday you can configure the programme according to your own needs. Should the pre-set schedules not meet your heating requirements, the PLCF heating plan enables you to create your own heating schedule. 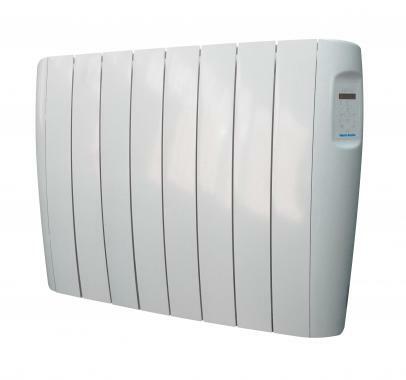 The VAAR750 is a 750W wall mounted aluminium radiator with an advanced energy saving digital thermostat. The VAAR1000 is a 1000W wall mounted aluminium radiator with an advanced energy saving digital thermostat. The VAAR1250 is a 1250W wall mounted aluminium radiator with an advanced energy saving digital thermostat. The VAAR1500 is a 1500W wall mounted aluminium radiator with an advanced energy saving digital thermostat.